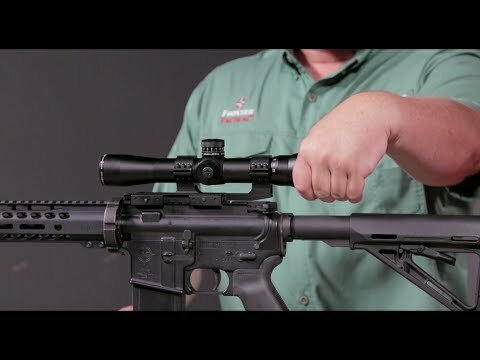 Near or far, the Sightmark Rapid AR 3-12x32 SCR-300 Riflescope gets you on target with razor-sharp clarity, digital reticle illumination control, a rapid power rotation eyepiece and precise, lightning-quick ¼ MOA windage and elevation adjustability using exposed, knurled, pop-up locking turrets. From recreational and competitive shooting to down and dirty hog hunting, this premium quality scope, complete with a finely etched SCR-300 black/red illuminated reticle, helps you make your mark with 110 gr. and 120 gr. .300 Blackout bullet drop compensation. With an operating temperature range of 0° - 122°F, the Sightmark Rapid AR 3-12x32 SCR-300 Riflescope delivers hermetically sealed, IP67 waterproof, fog proof and shock proof performance housed in a rugged 30mm single-piece 6061-T6 aluminum tube. Advanced, fully multi-coated, scratch-resistant lenses and generous 4.2” eye relief provide remarkable distortion-free clarity while exceptional light gathering and 10 illuminated-reticle brightness settings make target acquisition easy, even in lowlight environments. The Sightmark Rapid AR 3-12x32 SCR-300 Riflescope includes a limited lifetime warranty.